Kentucky is a state renowned internationally for fast horses and fine bourbon. 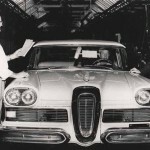 For 100 years, Kentucky also has been home to auto manufacturers who, focused on horsepower and staying power, have vastly overshadowed the state’s signature business sectors. 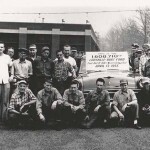 Few companies have touched as many lives as the Ford Motor Company, and even fewer Kentucky companies are so intertwined with the nation’s history. 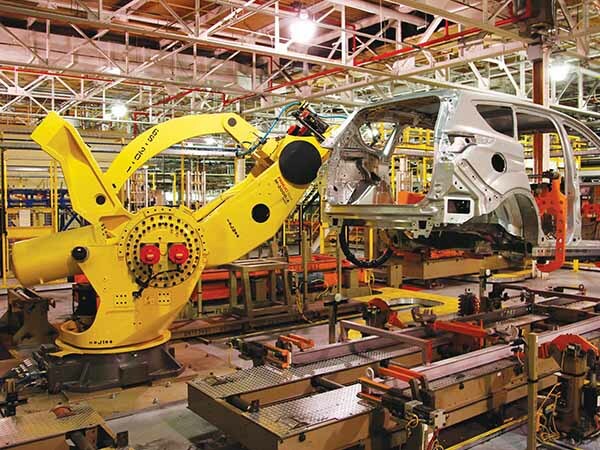 Ford innovated advanced manufacturing in Kentucky with the innovative and then state-of-the-art motor vehicle assembly line. 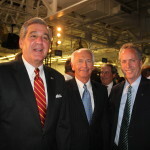 In the years since, the company has lived his words through investment in its Louisville facilities, adding people to the payroll, and indirectly creating thousands more jobs at the support firms that supply Ford with goods, services and workers. 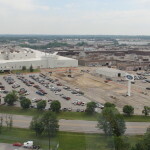 Ford’s Louisville plants have employed tens of thousands of people. Today, the Louisville operations directly employ nearly 9,000 workers, and more than 7,000 local retirees receive benefits from their careers with Ford. 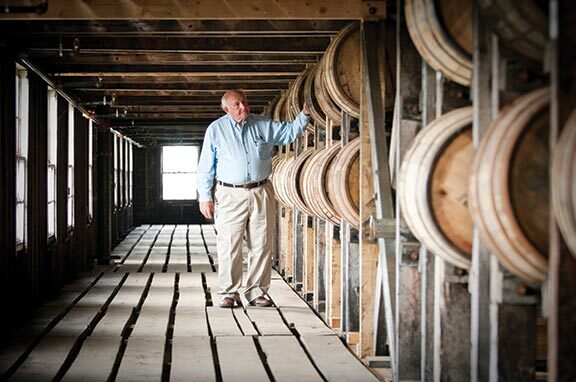 The economic and social impact over its 100-year history in Kentucky is nearly immeasurable. Even before opening his first plant here, Henry Ford understood the rich trove of natural resources Kentucky offered. Along the way, he bought coal mines, timberland and railroads; Ford also bought river ports to ship and receive raw materials and finished products. The company has since divested itself of these holdings and reinvested the capital into their operations. The variety of Ford vehicles built in the River City over the years is impressive. 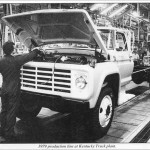 Louisville-built Ford trucks have long hauled goods across the United States. Tractors once made in Louisville cultivated farms; some are probably still in service today. 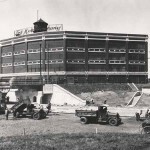 During World War I, the plant served as a training site for the U.S. Army Medical and Mechanical Corps; in World War II, the assembly lines produced military trucks and Jeeps made through a contract with the Willy’s Motor Co. When WWII ended, Ford Motor Company quickly retooled to produce civilian cars to meet the nearly overwhelming demand from returning soldiers anxious to start new, peacetime lives and enjoy the fruits of their hard-earned victory. 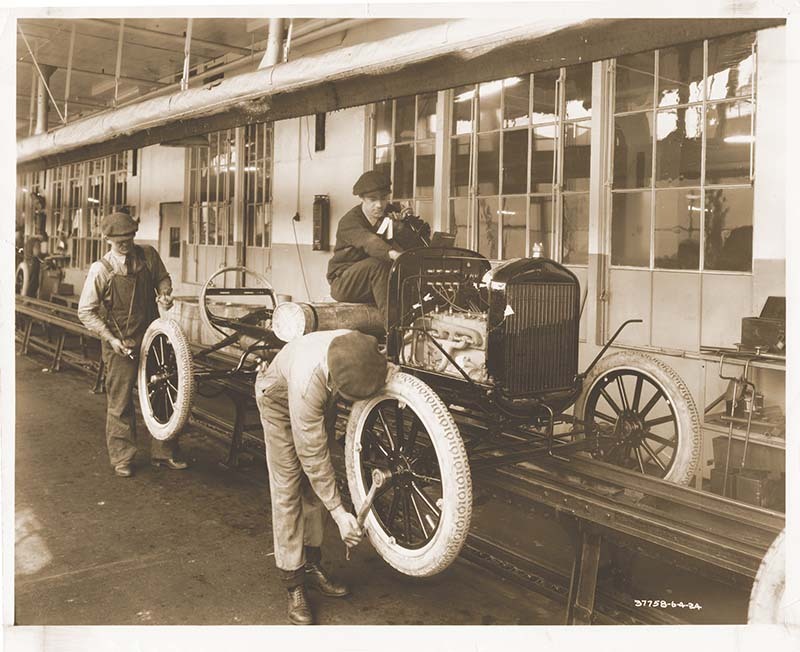 From its first year assembling about 12 Model Ts per day, to the thousands of vehicles made daily in the two plants, Ford has proved itself as a caring neighbor, an outstanding public citizen and a willing partner in Kentucky’s fortunes. 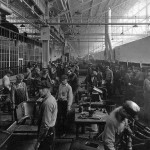 The contributions of Ford’s Louisville plants to American life manifest in ways many have never considered, perhaps because of the wide variety of things made there over the years. In war and in peace, as our country’s wants and needs changed, so have the plants. 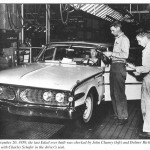 Ford Motor Company began it Louisville operations with 17 employees in a shop at 931 South Third Street. It wasn’t an official factory then, but a “branch agency,” the forebear of today’s vehicle dealerships. 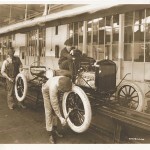 Model Ts were made in Detroit, but the cars were shipped partially assembled in crates – so Ford could fit 20 vehicles into a rail car compared to only four if fully assembled. Once the crates arrived in Louisville, workers assembled them and sold them at the branch agency. In less than a year, with business was booming in Louisville, the company acquired two adjacent buildings at 933 South Third for expansion. Today, Ford has two plants in the River City: Louisville Assembly Plant (LAP), where the all-new Ford Escape is produced; and the Kentucky Truck Plant (KTP), which manufactures the Expedition, the Super Duty and F-250 through F-550 pickup trucks, and the Lincoln Navigator. By 1910, the U.S. had 69 companies producing 2,700 makes of cars, but there is now a long list of extinct car brands – some disappearing in the past few years. 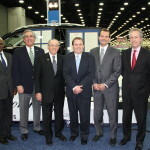 Ford’s longevity and continued global presence in a mercurial industry is indeed impressive. Just as America has seen rich and lean times, Ford has too. The Great Depression took its toll on the company because so few people were buying cars.To remain viable, Ford Motor Company sold off assets, including the railroads, and laid off workers. It survived when many other companies failed. 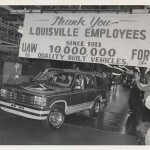 Though Ford’s Louisville plants have a rich history, there was a time in the recent past when their survival was in doubt. 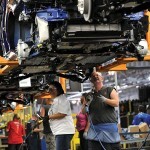 During the recession, management in Detroit was cutting costs and surplus manufacturing capacity. Many plants were at risk, including LAP. Through teamwork and strong leadership, along with economic development incentives from the Commonwealth of Kentucky and Louisville, the plant was transformed into the success it is today and thousands of jobs – at the plant and at supplier operations – and billions of dollars in annual revenue for Kentucky were saved. 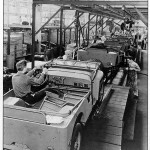 The Louisville facilities have produced a wide range of cars and trucks, including the Model T, Model A, Edsel, Fairlane, Galaxy, Sunliner and LTD cars; Ranger and F-series pickups; Mountaineer, Escape, Explorer and SportTrac SUVs; a wide range of heavy trucks; and a variety of others, including military vehicles. Ford’s famous Bronco II SUV was produced there, and today they are collector’s items often seen in movies and videos. 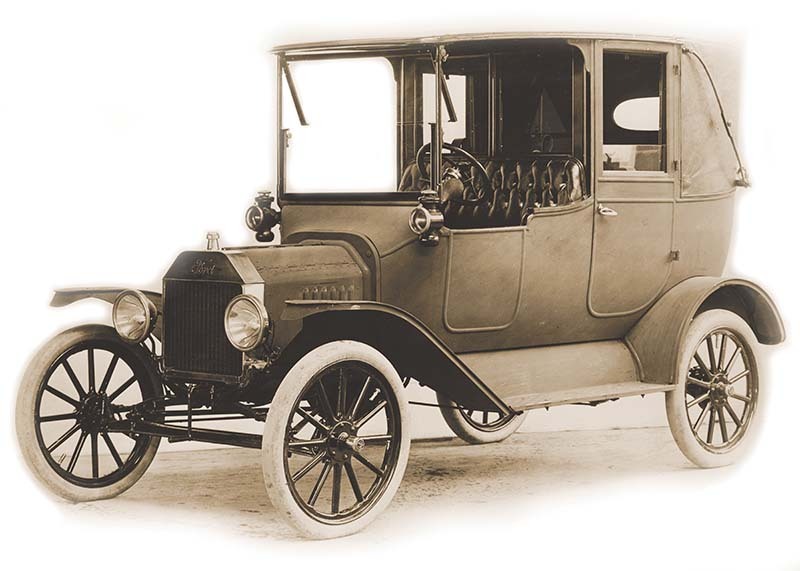 “To resent efficiency is a mark of inefficiency,” Henry Ford said in 1925. 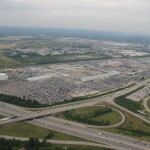 As manufacturing and logistical technologies have improved over time, Ford has consolidated its plants worldwide. The Louisville operations benefitted from the value of Kentucky’s central location and its skilled workforce. After a massive retooling in both plants, both Louisville plants are models of efficiency and flexibility. In recent years, the LAP was gutted and almost completely re-engineered. It can now produce up to six vehicles simultaneously, a feat once considered nearly impossible in heavy manufacturing. 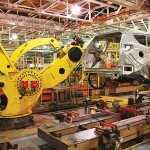 The plant has more than 1,000 robots, most of which are re-programmable to handle a wide variety of parts and vehicles. 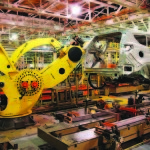 Perhaps the biggest advantage is that no downtime for retooling is needed because the robots are almost immediately “re-trainable.” This allows them to quickly meet changing customer preferences and keep the plant busy, avoiding manufacturing downtime. The $600 million investment transformed the plant into the global company’s most flexible high-volume plant – and one of the world’s most advanced manufacturing facilities. A second shift with an additional 1,800 jobs at LAP was part of the original 2010 announcement. In the fall of 2011, Ford Motor Company said the terms of its new national labor contract would create a third shift and added another 1,300 jobs. 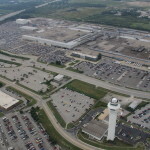 More than 1,200 employees transferred to Louisville in 2011 from other Ford locations bringing new families needing goods and services from area businesses. 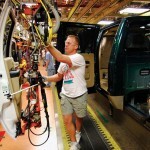 That contract also included another $600 million for improvements at the Kentucky Truck Plant. 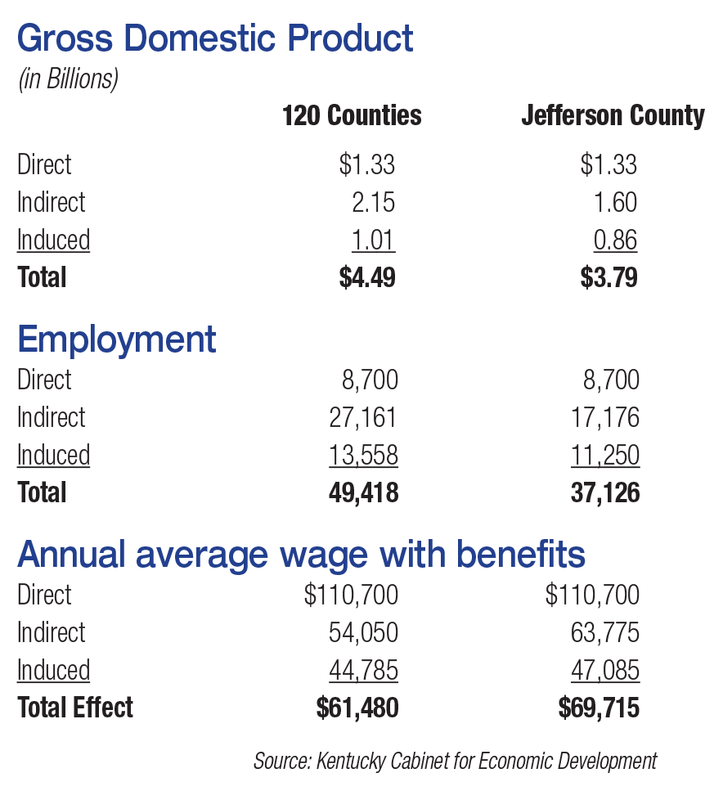 Kentucky’s Cabinet for Economic Development predicted that indirect jobs for non-Ford companies (suppliers, contractors, etc.) would contribute another $1.2 billion to the state’s economy. Today, payroll for direct jobs generated at the two Louisville plants has grown to nearly $1 billion annually, and continues to grow as the company finds new and better ways to make cars and trucks. • LAP has over 20 miles of conveyor belts, the distance between Frankfort and Lexington’s Keeneland thoroughbred race track. • Every 55 seconds, a new Escape rolls off the line. • Each hour, over 70 cars come off that line and bumper-to-bumper measure around three city blocks. • KTP has more than 6 million square feet of floor space; LAP has 3.15 million square feet. Ford places a high value on education for its employees, their families and the community. It knows that to remain competitive in the global market and produce the highest quality vehicles requires a talented, well-trained workforce. “That man is best educated who knows the greatest number of things that are so, and who can do the greatest number of things to help and heal the world,” Henry Ford said in 1924. It’s a philosophy still evident today. Ford offers tuition reimbursement for all employees who choose to further their education, which provides an opportunity for advancement many might otherwise not have. 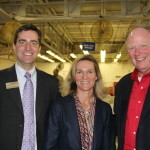 The company’s signature educational program is Ford Next Generation Learning, “a community-based program that mobilizes educators, employers and community leaders to prepare a new generation of young people who will graduate from high school college-and-career ready.” The program strives to make connections between what is learned in the classroom and how it applies in the real world. It also works to support community-wide efforts to align local business and community resources to help high schools improve their capabilities as “career academies.” Louisville is one of 17 communities in the program. LAP participates in the “externship” program. Along with police departments, Norton Children’s Hospital and other area concerns, LAP brings high school teachers in to let them experience how the plant operates first-hand. They work in different departments alongside plant personnel and receive training in functions from welding to robotics and logistics, then take the information back to their classrooms and integrate it into their teaching. More than 60 teachers will go through the Ford plant this year. In 1913, to help increase employee ranks to meet production demands, Ford offered the innovative $5-a-day wage — more than double the industry average at the time — and recruited thousands of African-Americans and immigrants. 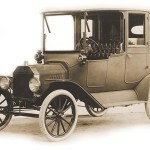 It helped create a new American middle class and established Ford as one of the first American companies to reflect the growing diversity of the United States. To this day, Ford works to create opportunities for all people. It created a Dealer Diversity program and has the highest total percentage of minority- and women-owned dealerships. 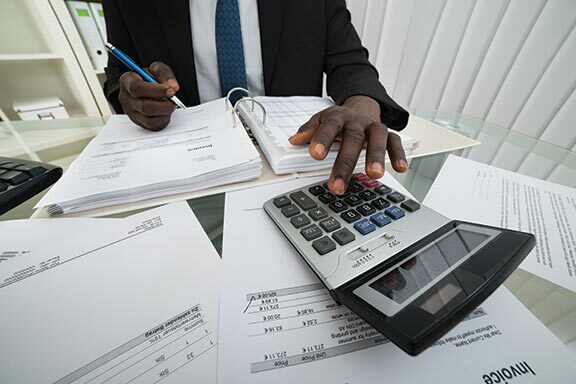 In 2011, Ford purchased $5.08 billion in goods and services from approximately 250 minority-owned suppliers and $1.06 billion in goods and services from women-owned businesses, exceeding company goals. 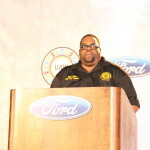 The plant and its employees are active in many other programs such as YMCA Black Achievers, and provides annual scholarships through the Ford African-American Network. For many years, employees have been active in the Urban League, 100 Black Men and a wide variety of other programs and organizations. William Clay “Bill” Ford, the company’s chairman of the board and great-grandson of Henry Ford, has made environmental responsibility a cornerstone of the company’s plans going forward. 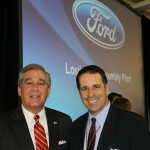 Under his leadership, Ford Motor Company in 2000 published its first corporate citizenship report analyzing the economic, environmental and social impact of company products and global operations. His stated vision for the company includes a concern for the broader world that the company touches. 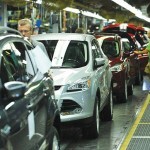 In June, Ford Motor Company released its 14th annual Sustainability Report. It recorded a 37 percent per-vehicle drop in CO2 emission levels at global facilities between 2000 and 2012,with a further 30 percent reduction planned between 2010 and 2025. Ford management believes that being “green” is profitable. 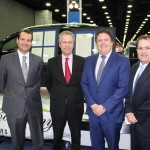 Sustainability issues are embedded in the company’s business plan, and are consistent with its aim to deliver great products, a strong business and a better world, said Ford CFO Bob Shanks. 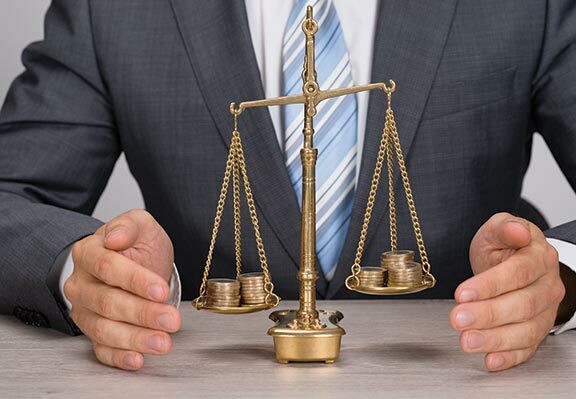 “We are much more proactive in understanding the importance of sustainability in the broadest sense – not only in relation to our products, but also in the quality of the financial results that we derive from them,” Shanks said. The Escape crossover vehicle manufactured at the LAP is 85-percent recyclable. The plant’s new “3-Wet” painting system eliminates the need for a primer spray booth (fewer chemicals), and an oven to bake the paint, which saves up to $1.5 million in energy costs per year. In the fall of 2012, LAP finished a new parking lot asphalt system to efficiently manage storm water runoff and protect nearby freshwater bodies. It reduced storm water runoff by nearly 18 million gallons per year. 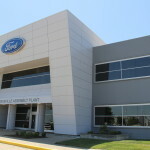 The plant was awarded Ford’s 2012 Manufacturing Environmental Award for that project. Talk to the employees and their enthusiasm is obvious. You hear comments such as, “I’ve been here for nearly 40 years and every day is an adventure,” and, “This place has given my family a better life than we ever expected when we came to town.” Employees are excited by recent changes and speak proudly of the plant’s flexibility, technology such as robots, and how it’s a highly advanced facility. They say they are more empowered than ever to examine how things are done and make improvements. If employee pride and spirit is any indicator, the plant has many years ahead of it. 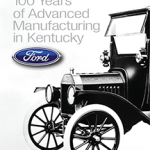 Ford Motor Company is celebrating the 100th anniversary of its Louisville assembly operations. 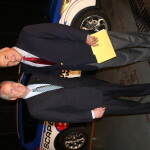 The company received resolutions from local and state elected officials, congratulating Ford on its contribution to the “economic, social and cultural heritage” of Louisville and Kentucky. 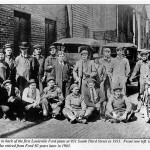 Ford opened its first Louisville Assembly Plant on South Third Street in 1913 with 17 employees who built an average of 12 cars a day. 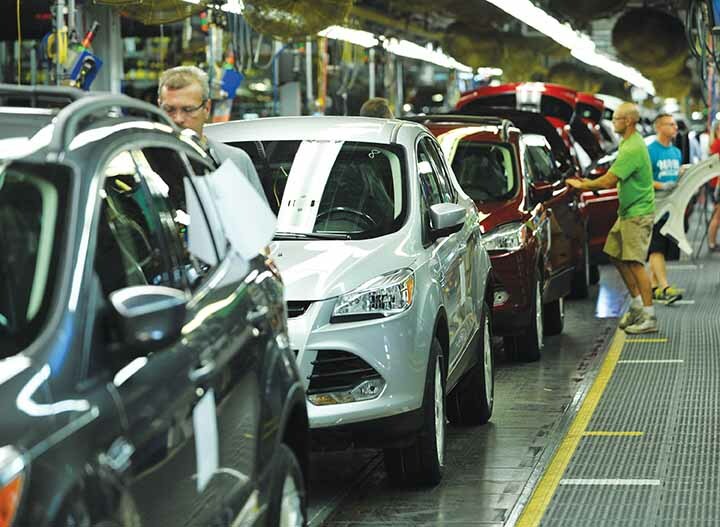 Today, Ford is Kentucky’s largest automaker, employing nearly 9,000 workers in two Louisville plants and assembling more than 650,000 vehicles a year. 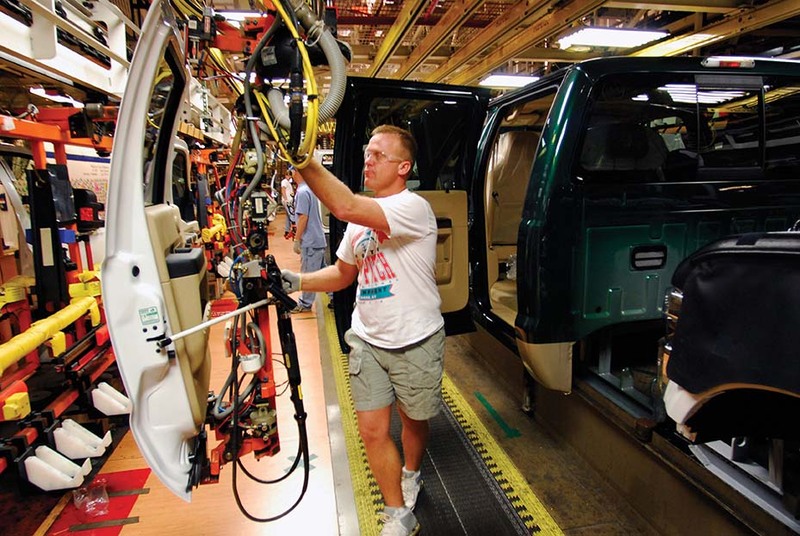 Louisville-made Ford vehicles — the Escape, F-250 Super Duty, Expedition and the Lincoln Navigator — are exported and sold in more than 140 countries around the globe. Nearly 170 companies supply parts to Ford’s two Louisville plants. 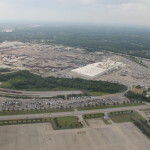 In 2012, Ford purchased $4.1 billion of production supplies from those companies and $108 million of non-production supplies. 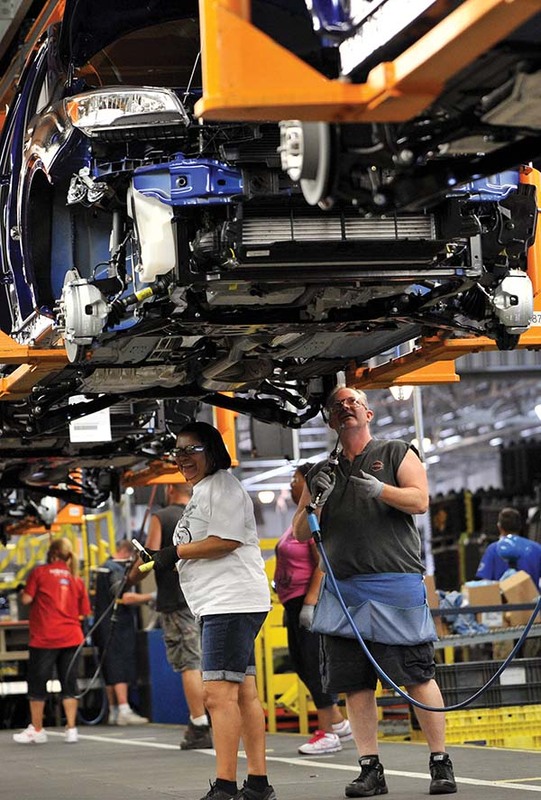 There are 53 Ford dealerships in Kentucky, employing more than 2,100 workers. More than 800,000 Ford vehicles are on the road in the commonwealth. From 2003 to 2012, Kentucky’s Ford plants contributed $11 million to fund local charitable contributions and programs. Workers at Ford’s Louisville Assembly Plant assemble the all-new Escape.